The feeding preferences of the species in your care must be determined, for example, is it a Herbivore (plant eating), Omnivore (plant and meat eating) or Carnivore (meat eating). Their specific diet should then be identified. 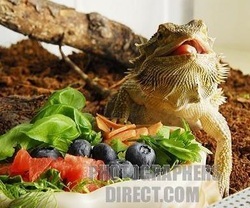 Feeding your reptile an inappropriate diet will result in nutritional imbalances, which will induce illness. The Green Iguana is an example of a strict herbivore, although in the past it was thought that juveniles benefited from being fed insects, this is not so. Certain foods for herbivorous species should be restricted or fed in moderation including water-containing vegetables such as lettuce, celery and cucumber which contain little nutrition, and if provided as a large proportion of the meal, will eventually lead to deficiencies. The excessive feeding of cabbage, kale, broccoli, brussels sprouts and cauliflower, may lead to an iodine deficiency as they are all iodine binding plants. Plants such as spinach, beetroot and rhubarb leaves contain oxalates which bind to calcium, preventing its absorption and in so doing causing a calcium deficiency. It should also be noted that fruits such as bananas can cause a sugar ferment in herbivorous reptiles leading to colic as well as sticking to the mouth, encouraging local infection. Tortoises, being browsers, will prefer to nibble at one plant and then move on to the next rather than consuming a large quantity of vegetation in one place. Considering their instinctual behaviours it is therefore preferable to offer them smaller quantities of food twice or three times a day rather than giving just one large meal. Commercial pellet foods for Iguanas and Tortoises must first be soaked thoroughly before feeding. The reason for this is because pellets can swell up inside the reptiles’ stomach causing colic or bloat. Insects should be gut-loaded 24-48 hours before being offered to the lizard. Gut-loading increases the nutritional value of the insect as well as extends its life. To gut-load an insect you can feed it various food items including carrot, apple, leafy greens (romaine, mustard greens, kale, collard greens) sweet potato, squash, bran, oats and various other foods. Commercial gut-loading products are also available. Remember that what goes into the insects is ultimately fed to the reptile. Do not leave live food in with your reptile unattended - insects have been observed biting and feeding off of the reptile and have also been documented perching on the preorbital area and ‘drinking’ fluid from the reptiles eye causing conjunctival or corneal irritation. It is very strongly recommended to feed snakes pre-killed vertebrate to prevent injury to the snake and unnecessary suffering to the prey animal. A varied diet would be beneficial for certain species depending on their natural feeding habits, for instance the Leopard Gecko is often fed exclusively on crickets though they would greatly benefit from a variety including locusts, mealworms, cockroaches, phoenix worms, horn worms, silk worms and butter worms. In the wild they may also feed on small mammals, lizards and birds eggs so the occasional pinky as a treat may be offered. Wax worms may also be fed but only as a treat as they are very high in fat and are notoriously addictive. When feeding lizards vegetables it is important to note that it is necessary to replace your chosen foods with other vegetables on occasion to prevent any toxins the plant may contain from building up. Changes in dietary requirements will occur as the animal ages, for instance juvenile lizards often require daily feeds while their mature counterparts will only require feeding every few days. Baby Bearded Dragons are also more insectivorous than adults as babies require protein and other nutrients needed for growth. Peculiar feeding habits may also be seen in juveniles, for instance, Green Iguanas have been seen eating faeces of their cage-mates, as the coprophagy helps to establish bacterial flora for fermentation in the intestinal tract. Do also be aware of the appropriate size of the food item for the reptile, for instance, mice should not exceed 1.5 times the girth of the snake. Impaction can also occur if insects fed to lizards are too large. Correct supplementation is also very important, there are multivitamin mixes available designed for the specific species in your care. Often calcium supplements are also required. A reptiles’ calcium to phosphorus intake ratio is often quoted to be 2:1 respectively, these two minerals work together in the body to maintain strong bones as well as having other important functions. Do be aware that it is possible to over-supplement which can be just as dangerous as a deficiency. Snakes generally do not require supplementing. It is advised to feed aquatic species such as turtles and terrapins in a separate feeding tank as these reptiles will have inevitably defecated in the water encouraging the growth of bacteria, which may lead to disease. Any supplements or uneaten food left in said water may encourage bacteria to grow. It is advised to use powerful filtration systems to minimise any bacterial growth. There are two main types of feeding behaviour observed in reptiles – the “sit and wait” approach and the “foraging-hunting” strategy. The opportunistic feeders which do not actively hunt are at greater risk of obesity as they do not expend energy seeking out food, so are prone to being overfed.